The modern hair coloring revolution came not through a safer product, or through a one-step, easy-to-use formulation, but through clever, image-changing advertising, wrote Charles Panati, the former Newsweek editor and a successful author of many books. 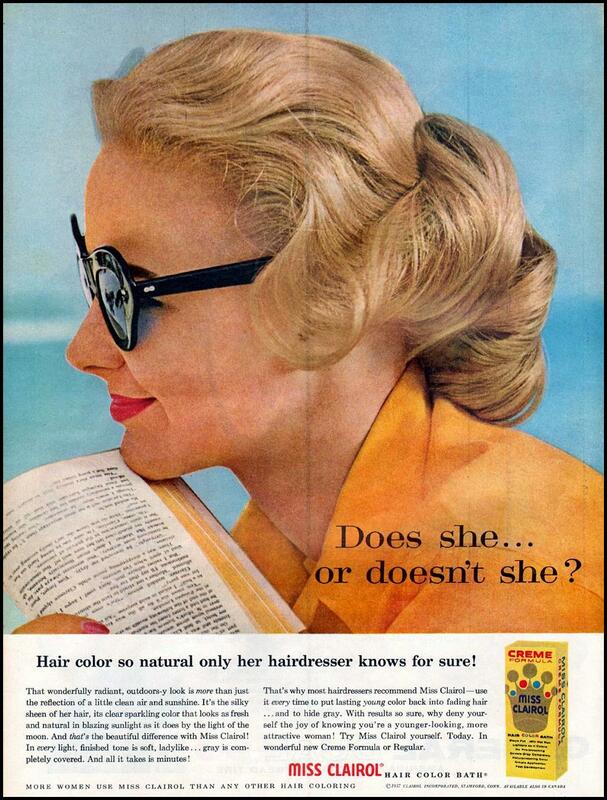 Specifically, it was the long-running Clairol campaigns of the 1950s and 1960s that asked – Does She or Doesn’t She? – that helped eliminate the stigma for women who were trying only to hide a few strands. With a wink the subhead in these ads replied: only her hair dresser knows for sure! In 1949, the single-step Miss Clairol Hair Color Bath was introduced to the American beauty industry. In 1956, Clairol launched an at-home version of Miss Clairol Hair Color Bath and became a household name. Clairol’s one-step home color was a breakthrough in the beauty industry as was its advertising campaign. Clairol hired the advertising firm Foote, Cone & Belding, which assigned the account to a junior copywriter, Shirley Polykoff, the only female copywriter at the firm. When Polykoff met her future mother-in-law for the first time, she took her son aside and asked him about the true color of his girlfriend’s hair. Does She color her hair or Doesn’t She? The embarrassed Polykoff could imagine what her mother-in-law was asking. Although, Polykoff did color her hair, the practice was not something to which women openly admitted during that period. In 1956, when Polykoff was assigned the Clairol campaign hair dye was still considered to be something not used by genteel women. Polykoff remembered and recalled the question her mother-in-law asked – Does She or Doesn’t She? and one of the century’s most enduring, appealing and successful advertising slogans was born! Does She or Doesn’t She? became a very effective and memorable slogan. The first time Clairol asked this question in 1957, the answer was 15 to 1. That’s right, only one in fifteen women were using artificial hair color. Just eleven years later, the answer was 2 to 1 according to a report published by Time magazine. In 1967, eleven years after the launch of the Clairol campaign, Polykoff was inducted into the Advertising Hall of Fame. Malcolm Gladwell wrote in True Colors, a 1999 New Yorker history of a hair dye that: Clairol captured the feminist sensibility of the day with a shampoo-in hair and memorable advertising slogans. In writing the history of women in the postwar era, did we forget something important? Did we leave out hair? What is the secret of Clairol’s uncommon advertising success? Clairol did the opposite of what most marketers would do. They didn’t want everywoman on the street running around saying that they were using their product. Instead they wanted women to understand that their product was so good, people wouldn’t be able to tell if they were using it or not. Sometimes, simply conveying how and why your product works is not enough. Showing becomes more effective than telling. Can you think differently for your products and design compelling communication strategies? Strategies that rather show than tell about your products?